The most important step in becoming good at tuning drums is to practice--tune a LOT! Be brave--find a sound that is YOU. The more time you spend experimenting with tuning, the less you will fear doing something "wrong". There IS no wrong sound. If you ask every drummer you meet how to tune, you will probably get a slightly different answer from each one. Clear heads-- Clear heads are known for their tunability, and bright, open resonance, with plenty of attack. These heads are used by many drum manufacturers as standard for toms and bass drums.Batter Heads are used on the top of drums (the side you strike with your sticks and Resonator Heads are for the underside of the drum. Drum heads basically come in three thicknesses:thin, medium, and thick. Years ago, Remo gave these thicknesses names: Diplomat, Ambassador, and Emperor . These names are so well-known that if you go to any drum store and ask for, for example, an Ambassador -weight head you will get a medium thickness head no matter what brand you might choose. So a nice safe choice if you are just starting out with tuning drums would be Remo Clear Ambassador Drumheads for your bass drum and toms. You can make adjustments in the weight as you learn more about what you like. There are so many choices--how to decide? My advice is to stick with the basics and then when you have a specific sound in mind, try various heads to achieve that sound. Although much of the unwanted overtone sound (ringing) can be controlled by proper methods of tuning drums, there are situations which require a little extra treatment. If you are in a live situation and have no other resources, you can resort to good old duct tape to get rid of a slight high-pitched ring. You may have to move the tape to different points on the head until you find the source of the ring and you may have to use more than one piece. Place the tape so that it does not interfere with the playing area of the head. Be sure to leave little "handles" on the ends of the pieces of tape so you don't have to scrape it off of your head later. For a more aesthetic and most times more effective solution for tuning drums, you can make a donut out of an old head. Find an old head the same diameter as the head you need to muffle. Cut around the edge removing only the rim, but leaving the edge flat. Now cut a smaller circle out of the inside piece. The donut should be about 3/4" to 1" wide. Place it on top of the drum's head. If the donut flies off at inopportune moments, affix it to the head with SMALL pieces of duct tape stuck to the rim. Or you may purchase a commercial version such as REMORINGS These are presized versions of the homemade donut. They now come in a couple different varieties. Choose ones that match the size of your drums. There are also drum heads with built in rings. By the way how do you measure your drums? Measure from the outside edge of the shell to the opposite outside edge (diameter). Do not include the metal ring. Heads are measured in inches, so if you come up with something in between, you probably need to measure again. Of course, there are those who say that drums should NEVER be muffled. Some things you just have to decide from your own experience. 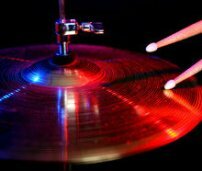 If you want to learn to play your favorite songs,be sure to check out the ALMOST FREE DRUM TABS on this site!These tabs are tremendously popular due to their quality and guaranteed accuracy. Leave "Tuning Drums" and Return to "Free Drum Lessons"
Leave "Tuning Drums" and Return to "Absolutely Free Music Lessons"